An upcoming cold front is threatening the possibility of a winter storm already, but I'm not ready to dash through the snow on a one-horse open sleigh yet. Daydreaming and preparing for a white Christmas is another story, though. Rose of In Dreams Design rounded up several handmade horse listings from Etsy. Holiday gift ideas for horse lovers include dancing horse coin purse by House of Lussier, sea horse ornament by TGW Outlet and my golden unicorn magnet. 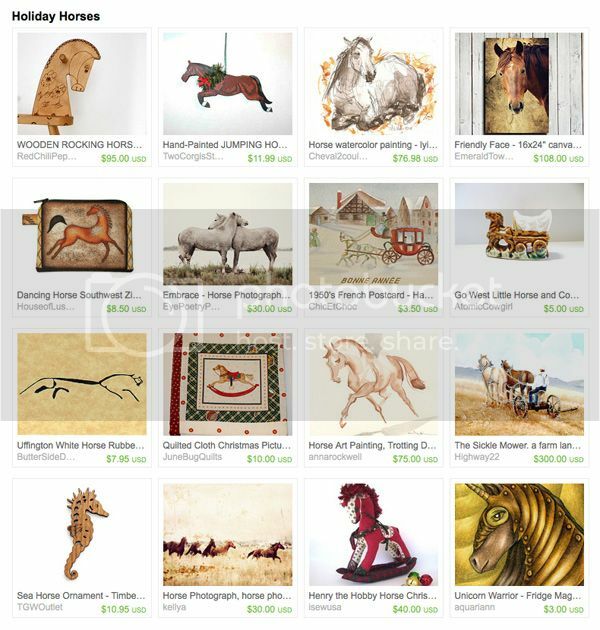 Beautifully curated collection of horses. Thanks for sharing Dana!